While I express my current views below, I always go into meetings ready to listen and with an open mind. I may positions I learn new information and participate in debate. The Grande Prairie Catholic School Board has requested land from the City to build a bus maintenance facility. Management has identified a site in the Vision West Business Park. It is a City owned lot which was previously set aside to accommodate potential outdoor recreation facilities. The land is currently designated as Public Service which would not allow for a maintenance facility. 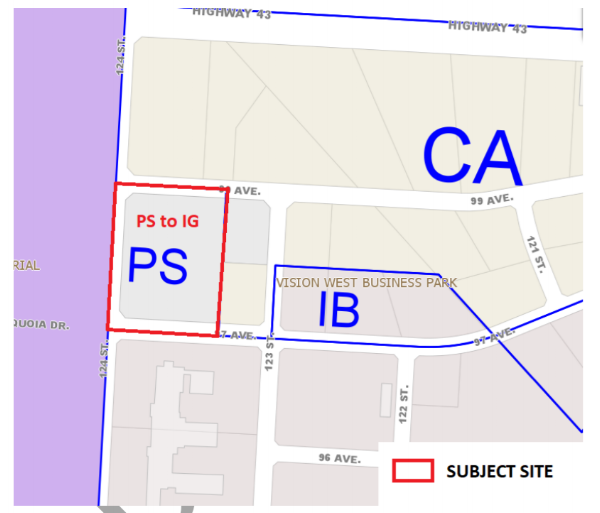 Council will debating a bylaw amendment to rezone this lot to General Industrial. This matter was before Council on December 3. At that time, Council defeated a motion to undertake this rezoning. I was in favour of Council rejecting this request. I had no concerns about land use. However, at the time, I was not convinced that we should be giving this land to the Catholic School Board. Council raised concerns, and no representatives from the School Board were available to address them. The Catholic School Board buses a lot of City residents for programs of choice. Additionally, a lot of its County resident students are transported using Peace Wapiti buses. Catholic School Board buses are used for a much higher proportion of City residents than I initially assumed. The original earth on this property was used for other developments, then replaced with fill. This makes it marginal property due to likely ground settling. Concrete and asphalt lots are unfeasible, and any buildings require extensive geotechnical work to support their foundations. I’m likely to support this proposal at Council. Earlier this year, Council approved a loan to the Grande Prairie Storm. Now Council needs to approve a lending bylaw to make it official. Since this money has already been promised, I will be voting in favour of this bylaw. Click here to read in depth about Council’s discussion regarding the Storm. This loan will be for $200,000. The terms are that it will be paid back over 5 years with a 4.25% interest rate. The Storm are part of a non-profit society, not a business. There are no individuals or corporations who derive profit from the team. The City has had access to their books to verify their revenue and expenses. The Canadian Revenue Agency is also very serious about making sure no dividends are taken out of non-profit societies. The Storm does have stakeholders (including the board members) who have put in approximately $350,000 of capital to keep the team going. Because it is a non-profit they cannot take money out of the team as profit. And because it is NOT a charity, they don’t get to write this money off as a tax deduction. City management will need to authorize the disbursement of this loan amount. They are instructed to make sure that local vendors and credit cards are paid off before anyone else. Built into the loan agreement will be a provision that the City’s loan needs to get paid back before any of the stakeholders who have given low or no interest loans are paid back. I voted yes because I am confident that the team will pay back the loan. However, if I am wrong and the team defaults, the City will get ownership of the franchise. Its value has been estimated to be $500,000 or more. Based on some research I have done, I’m confident that the franchise is worth more than the value of this loan (click here for once example of why I believe this). I voted in favour of this loan because I am confident that it will help the team become sustainable, will get paid back, and will be a net profit for the City. We have a very responsible and experienced Commission. I trust it to make appropriate recommendations. I will likely be supporting these changes. You can read this framework here. I intend to vote in favour of endorsing it. The City has passed Supplementary Property Tax bylaws every year since 1995. These allow the City to collect taxes on newly constructed buildings or major renovations in the same year as they are completed and occupied. The taxes levied are pro-rated to reflect the actual occupancy of a building or improvement. For example, if a house is occupied in November it will only be charged for two months worth of taxes in the year that it is completed. If Supplementary Assessment Bylaws are not passed, then owners will not be taxed on new buildings or improvements until the year after they are completed. I intend to vote in favour of the Supplementary Assessment Bylaws. Not having these bylaws passed would create inequities between people who completed a building in 2019 but paid no taxes and people who completed buildings in 2018 or earlier. We also always have great conversation in the GP Round Table group Facebook.